As a whole food plant-based nutritionist, I always recommend tempeh (tem-pay), because it’s one of the least processed forms for soy (soy beans/edamame being the absolute least). Tempeh is basically fermented soy beans all squished together into a block. It’s a very versatile food: You can bake, fry, saute, slice, marinate, or even grate it. It also works in many different cuisines – from Mexican, to Thai and Italian, Tempeh might well become you new plant-powered go-to. Tempeh is packed with nutrients and is very high in protein, so a great addition to a healthy vegan diet.A 3-ounce (84-gram) serving of tempeh contains 15 drams of protein. But, the way you prepare and cook your tempeh determines whether or not you’ll like it – you need to marinate the heck out of it. It’s similar to tofu in that it absorbs whatever flavor you want to impart. But in of itself it does have a little more flavor that tofu (which is totally bland). Some people like to steam tempeh first because it will soften it up a bit, but this is way too much prep for me. I just let it marinate on its own and then get ready to get give it crunchy texture in my air-fryer or frying pan. 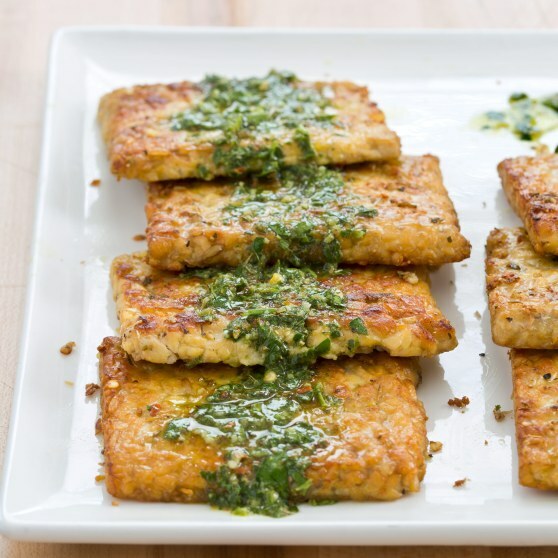 I have load of recipes using tempeh, but one of my favorite is a simple tempeh “steak”. Heat 1 tsp of oil over high heat in a non-stick or well-seasoned cast iron skillet. Don’t be tempted to turn it over until the sizzling sound stops and it moves easily across the pan (you don’t want to rip the crust off! But when the slices are ready, flip them. They usually need about 2 minutes on each side. Toss all the sauce ingredients in a blender or food processor and blend until you get the consistency of pesto. I like to serve my steaks immediately with a side of cauliflower mash and some gently steamed baby carrots. But any seasonal veggies would be delicious. Once plated up, drizzle each steak with the sauce.